An image of Kerberos, one of the two tiny moons of Pluto, has finally been returned by the US space agency's New Horizons probe. It shows the object to have two lobes, which may be the consequence of icy bodies bumping into each other and joining up. Kerberos's larger lobe is judged to be about 8km across. The smaller lobe is roughly 5km in diameter. Styx, the other little moon in the system, is of a comparable size. Mission scientists say these satellites are brighter than they expected. Planetary bodies usually darken over time as a result of chemical changes triggered by sunlight and cosmic ray impacts. But these moons reflect about 50% of all incident light, which indicates their water-ice covering is very clean. 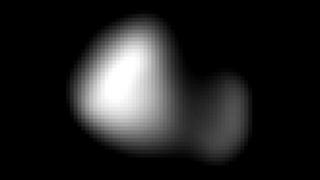 Kerberos orbits about 60,000km from Pluto and is the second-outermost of five moons. It sits between Nix and Hydra, and beyond the orbits of Styx and the much larger Charon, the dominant moon in the system. The newly released image of Kerberos was acquired by New Horizons' Lorri camera from a distance of just under 400,000km. The picture incorporates a number of views and has been processed to recover as much detail as possible. New Horizons continues to downlink its data gathered during the flyby of the dwarf world back on 14 July. The probe is currently moving deeper into space and is now more than 5 billion km beyond Earth. This week sees the start of manoeuvres to change the trajectory of the spacecraft. The intention is to send it towards another Kuiper Belt Object called 2014 MU69. This encounter would occur in 2019, although Nasa has yet to formally agree to fund the operation of New Horizons that far ahead. Scientists will first have to write a proposal for a mission extension. It is likely they will submit this next year.